My Very Own Little Tin Tin! I know, I’ve been pretty scarce. Sorry. I was in quite a funk the 1-2 weeks following Christmas. Then I spent last week in Nebraska doing some Air Force Reserve work. Nothing in particular with the funk, I just didn’t feel like writing. I also have been pretty slow with the camera too, I’ve very few pictures to offer. I promise that will change next week! So here’s a story for you. Just before I left for Nebraska two weekends ago, the family went to see The Adventures of Tintin. What a fantastic movie, by the way! Certainly isn’t just for kids! 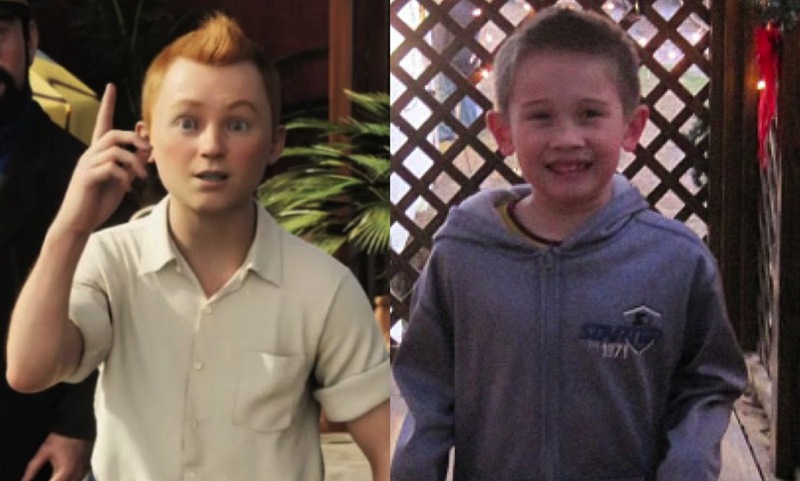 The CGI animation of Tintin reminded me SO MUCH of Timmy. I couldn’t help myself…I had to make a comparison, so here it is! This is a picture of Timmy from our trip to the Santa train about 3 weeks ago. And yes, as one could guess, Timmy wants to be Tintin for Halloween. Happy Boxing Day! I KNOW You’re Wondering…. Fox hunting is now illegal in the UK, but Boxing Day is still the country’s biggest hunting day, with the hounds searching for a “dragged scent” instead of a real animal. Happy Boxing Day! I know for Americans, this is the day we get in lines to return gifts, and hit the mobs of shoppers grabbing wrapping paper, Christmas trees and strings of lights at at least 50% of off! The retail industry has even termed the day “Mega Monday“. For most nations in the Commonwealth of Nations, the day AFTER Christmas is also a holiday: Boxing Day. Have you ever wondered what exactly Boxing Day is? Is it a day where everyone watches boxing? According to Wikipedia, the origins of Boxing Day seem to come from a tradition where wealthier citizens would give gifts — boxed gifts — to their servants or other trademen in service to them (such as their cobbler or ice delivery man) on the first weekday AFTER Christmas…this is when servants would usually get an extra day off, also. This was from a year ago today, but it’s worth reviving for this year, since I laugh so much from the stupid names of some of these products! This week I’m volunteering at a fireworks stand. For those saying “Wow! How?”, let me explain a little. The state of Nebraska allows 10 days per year for free-for-all fireworks sales/use. There are some exceptions: none of this is legal in the Omaha city limits, and Lincoln only allows sales for 2 days. So starting on June 25th, you hear the explosions as everyone’s having a good time with their loot. In our neighborhood, it’s only really loud till about 10pm…except for July 4th, I know last summer we were launching till midnight, at least! In Bellevue, and perhaps in other cities (but I don’t know for sure), local non-profits can pay the licensing fees and sell the fireworks as a fundraiser. I got an e-mail from the Bellevue Soccer Club looking for volunteers to help man their club’s fundraiser fireworks stand up the road from us. My first thought? DISCOUNTS! Even though I was TDY at the beginning of the week, and we’re leaving on vacation at the end of the week, I still thought it’d be a fun thing to do, so I volunteered to do 2 four-hour shifts. Some are benign. There’s no doubt what this is, right? Some are sillier. And we start to lose any sense of what’s in the packaging. And here are some others…enjoy! I have an awesome watch. I’ve had this watch since my college graduation in 1995. It was a gift from my parents…16 years ago this week. Yep, that’s a now-extinct Nittany Lion statue in the middle of the dial. Being that it’s a Seiko, it has performed incredibly for the past 16 years. About 2 weeks ago, the watch stopped. This has happened before, and all that means is a new battery. I typically have to change the battery out every 18 months. I took it to the mall to replace the battery, but the watch didn’t resume working right away. It played dead for a day or so, then started working. Yeah, it’s gaudy, but I wanted to have a little fun. Being that I have some AF Reserve drill days next week and chances are my Seiko won’t be done by then, I’ll need to think twice before putting on this new watch with my uniform. Since it’s supposed to be conservative. A story published in the London Telegraph online brought me a smile this morning. The co-producer of this year’s Best Picture, The King’s Speech, Simon Egan, was celebrating the movie’s Academy Awards success at a Hollywood party with his 15-month-old daughter Lara in attendance. 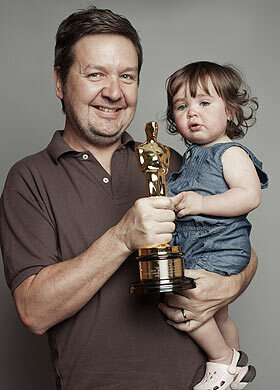 Another party guest let Lara hold the Oscar so folks could take pictures. As expected, that statuette slipped right out of her hands! You can view the video through this link. Mr. Egan immediately contacted the American Academy of Motion Picture Arts and Sciences, and was relieved to learn that the Academy has a program for repairing damaged statuettes. Lesson learned — unless you’re Walt Disney with 26 Oscar statuettes to spare, think REAL hard before letting your 15-month-old loose on your symbol of the pinnacle of your career! 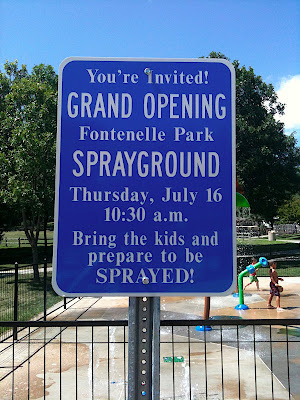 Today Shannon and I took our boys to this new “splashpark” that opened 2 weeks ago in North Omaha. What a fun, FREE, way to spend a hot summer afternoon! School starts Monday! Today the boys spent nearly 3 hours at the park — then the horseflies started attacking and the boys were happy to go. Shannon and I sat under a tree in the shade and had a good old fashioned chatfest. This particular one was intriguing: there’s this innocent looking post stationed near the entrance to the fenced area — you rub the top of the post (yes, I know what I’m saying here) and that activates the water for 5 minutes. As long as a kid runs back to the post every 5 minutes or so, the water stays on. A nice conservation tool. You can see the post in the 3rd picture here. Ring Ring Ring Ring…Banana Phone! The song is stuck in my head now. Why? 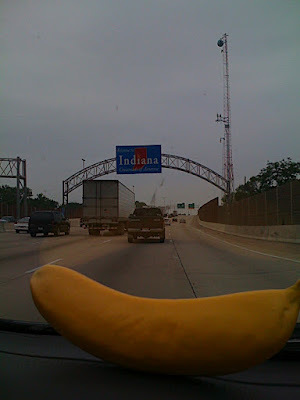 Because we brought this artificial banana with us on vacation and Dave has been charged with photographing it everywhere. Yes, like Flat Stanley. 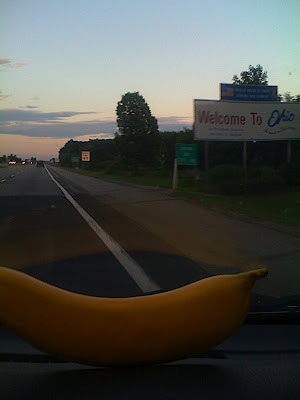 The pictures of this banana as it travels across America are being assembled in a photo album for one of Dave’s colleagues, who uses this banana as punishment for those who arrive at his unit’s physical training sessions late. 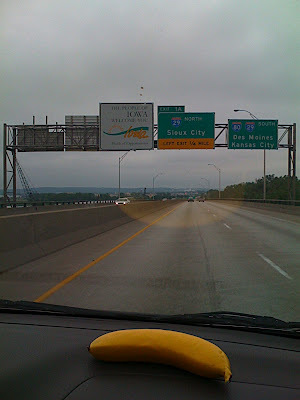 Tomorrow we continue on I-80 all the way to New York City. According to our GPS, it should only be about 7-8 hours worth of driving (compared to 10.5 hours today). We hope to be out of our hotel by 0800, try to get to NY before dark. I got this from Christina of Sugar Sweet Thoughts <http://christinagblogspot.blogspot.com/2009/02/100-life-experiences.html>, who got it from Must Love Tots <http://mustlovetots.blogspot.com/2009/02/lifes-experiences.html> who got this from Scientific Nature of the Whammy <http://www.snotw.com/2009/02/100-life-experiences.html> who got this from Megan <http://newlywednewlybredinne.blogspot.com/> . It looked like fun, so here goes! Hopefully no identity theft issues with this one… Not sure what an identity thief or potential terrorist will do with the fact that I've never gone skinny dipping but have run a marathon. *6. Given more than you can afford to charity.